Home > Shop By Brand > GYEON Car Care > GYEON Q2M Compound+ 1000 ml. Take your heavy-duty cutting power up a notch! GYEON Q2M Compound+ is an advanced defect-removing formula that gives you the increased cutting and finishing power. GYEON Q2M Compound+ is designed to remove even the heaviest defects, including swirls, holograms, oxidation, and more. Perfect for use with both dual action and rotary polishers, as well as foam, microfiber, and wool pads, GYEON Q2M Compound+ is a versatile formula that helps you achieve a flawless finish. 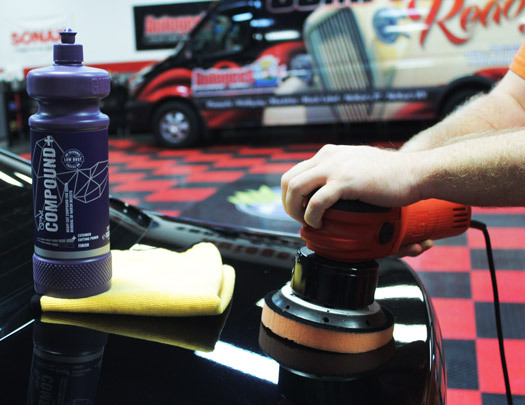 Removing swirls and paint defects from your paint is easily the toughest part of detailing. Not only because of the physical work involved, but also because trying to find the right compound/polish/pad combination for your paint can be tough. GYEON has made that decision a little bit easier because their new GYEON Q2M Compound+ achieves the best results with any machine, DA or rotary, or any pad, foam, microfiber, or wool. GYEON Q2M Compound+ is a step up from the original GYEON Q2M Compound in that it cuts heavier and harder, providing quicker results during use. Engineered with high-quality abrasives that finish very well, GYEON Q2M Compound+ is low dusting and contains no silicone or fillers, making it body shop safe! Take some of the guesswork out of the paint correction conundrum – use GYEON Q2M Compound+ to remove heavy defects like swirls, holograms trails, scratches, and oxidation quicker than ever before! GYEON Q2 Pure 30 ml.GYEON Q2 Pure 50 ml.GYEON Q2 One 30 ml.GYEON Q2 One 50 ml.GYEON Q2 SyncroGYEON Q2 Mohs Ceramic Paint Coating - 30 mlGYEON Q2 Mohs Ceramic Paint Coating - 50 mlGYEON Q2 Matte 50 mlGYEON Booster - 30 mlGYEON Q2 CanCoat - 200 mlGYEON Q2 Trim - 30 mlGYEON Q2 Rim - 30 mlGYEON Q2 View - 20 mlGYEON Q2M Compound+GYEON Q2M Compound 120 ml. GYEON Q2M Compound 1000 ml. GYEON Q2M Polish 120 ml.GYEON Q2M Polish 1000 ml.GYEON Q2 Primer 120 ml.GYEON Q2 Primer 1000 ml.